Dedicated and committed, Gareth has a comprehensive understanding of what it means to have a successful property transaction from start to finish. He prides himself on his determination and honesty and, by upholding these qualities, he will consistently achieve the best result for his clients. A positive team player, Gareth looks up to his peers; seeing them succeed inspires him to always work towards perfecting his professional skills. He is a dedicated, hard-working member of our team, never going home until he feels like he has achieved something great for the day. Gareth lives in Burnie along with his wife and young family, where they have purchased their own family home right on the coastline in Ocean Vista. 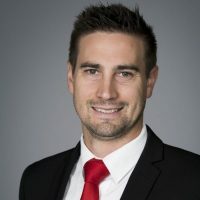 He has been actively involved in the local community having operated his own Personal Fitness business and has been heavily involved with local sporting clubs. During his school days and as a young adult Gareth competed in athletics and had a successful time competing at the Tasmanian Athletics League Carnivals winning multiple Gifts and Sprinter of the Year Titles. He still loves staying fit and being active. A valued member of our team, Gareth looks forward to assisting you with your future property transactions. Meet some of Gareth’s happy clients. Gareth's service has been second to none, from our first conversation Gareth delivered & met our requests in record time. He was authentic & shared our excitement when we found our dream home. Communication was impressive, he kept us informed every step of the way & our experience has been nothing short of outstanding. We absolutely recommend using one of Burnie's best Agents. Would you like to speak to Gareth? If you’re thinking about renting or selling your property and you’d like a clearer picture of how much your property might be worth or want to have an informal chat about general property market trading conditions, Gareth will be happy to arrange a full market appraisal of your property.